Do you ever wish you could know when a sports game was really getting good? Like, imagine if a Monday Night Football game ended with a controversial Hail Mary touchdownterception that everyone was talking about, but instead of just watching it on Sportscenter or reading about it, an app would alert you when the game was getting dramatic so you could watch it live. The company has iPhone, Android, and Google TV apps alerting users to exciting sports events in real time, using algorithms, social signals, and user preferences. Thuuz has a feed “not too dissimilar from a Facebook feed” that features original sports news content and notifications, where users can follow their friends as well as experts. 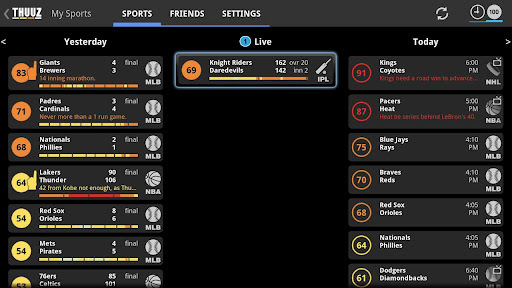 Users can also integrate their fantasy teams, even across multiple platforms like ESPN and Yahoo leagues, into the app. Every sports game in Thuuz gets a score from 0-100, with 100 being a “can’t miss game” and 0 being a game featuring any sports team from Cincinnati. The score is based on momentum, the context (like playoff implications or a rivalry game), and how close the score is. Games are assigned a pre-game score, and the scores then oscillate throughout the game as it becomes more interesting or boring. Packard said he was watching sports one day and thought it’s amazing how many people just relegate themselves to watching Sportscenter for top plays and great games long after they’ve finished. He started rolling with the idea of notifying people of great games in real time, and started Thuuz “on the side” a few years ago. He built a small website that started to build momentum and re-launched around the 2010 World Cup for soccer when he got a deal with ESPN3 to send users to ESPN3’s site to watch the archived soccer games. Packard says Thuuz is now working with both service providers and content providers, such as Dish Network, which just launched Thuuz on its set-top box; users can pull up Thuuz on their TVs if they have Dish Network to see what games are great right now and what exciting games are coming up. The company also has deals with AT&T, Sprint, and T-Mobile to drive users to sports streams on mobile. “We take your idle time and turn it into wasted time…you can watch more sports!” Packard jokes. It’s pronounced “thews” (rhymes with news); Packard says the name is based on the middle part of “enthusiast,” as the company targets sports enthusiasts. “The one thing you don’t get if you break the cable is your local sports coverage,” Packard says, explaining how attractive the sports market is as providers try to stop users from leaving TV for online services like Hulu. Packard says the company has seen 5 percent to 10 percent of its user base shifting to different content based on momentum swings in games. Packard tells me the company’s original target was $4 million, but it ended up raising $4.5 million; he said “a few entities were slow,” accounting for the remaining funding gap. I’m a huge fan of the app. I’m a big sports fan, but sadly don’t have the time to constantly be watching random games that don’t involve my hometown heartbreaking Philly teams or beloved Stanford Cardinal. But if an app would tell me when October baseball games are heading to extra innings? You’d better believe I’ll ditch the Econ books and run out of the library to watch, which is exactly what these content and service providers want. For the record, Thuuz’s Series A funding is about $1.2 million more than the per-season gap between the NFL and referees. I wonder if Thuuz can convince their investors to let them drop some serious coin on what would be insane marketing. I’ll write the blog post “Sports App Pays For Real Refs To Return” or “NFL Rejects $3M Offer From Startup To End Ref Strike.” Pure gold. But, alas, I dream….